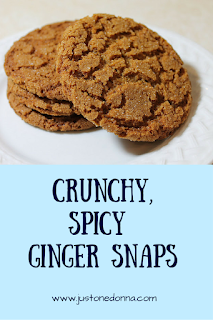 Crunchy, spicy, and yummy are all words used to describe a good gingersnap cookie. My hands-down, favorite cookie is a gooey chocolate chip cookie but occasionally spice cookies, like gingersnaps and this molasses cookie, call my name. Did you know the gingersnap cookies we make in the United States are related to ginger cookies made in the United Kingdom and Scandinavia? In the U.S., gingersnaps are usually a drop cookie with lots of cracks in the surface. That's exactly how I like them. Those found in other countries may be thinner and sliced. The Lebkuchen, a traditional German cookie, and the pepparkakor, from Sweden, are often cut into festive shapes. My gingersnaps are round. These gingersnaps are tasty cookies any time of the year. Their spiciness is perfect as a holiday cookie, as well. Enjoy them with a hot cup of coffee or tea, or a tall glass of milk. In the summer, spread some vanilla ice cream between two gingersnap cookies for a sweet and spicy ice cream sandwich. You can even crush ginger snaps and use them for a cheesecake crust. However you decide to use them, gingersnaps should be in your cookie rotation. Preheat the oven to 375 degrees F. Mix together the brown sugar, oil, egg, and molasses in the bowl of your mixer, fitted with the paddle attachment. In a separate bowl combine the flour, baking soda, salt, and spices. Add the dry ingredients to the molasses mixture, mixing to combine. Roll the dough into balls 1-1/4 to 1-1/2 inches in size. I like to use a cookie scoop to keep my cookies uniform in size. Roll each ball in the granulated sugar to cover. Place the balls on an ungreased baking sheet. Bake for 10-12 minutes until browned and the centers are set. You might also like this molasses cookie recipe. This sugar cookie with buttercream frosting is one of my favorites, too. Are these similar to snickerdoodles? My husband loves those. No, Heather, these gingersnaps are not at all like snickerdoodles. Snickerdoodles are softer with a more mild flavor. I have tried several times to print this recipe, but the "printer friendly recipe" comes up as a blank page. I suppose that is about as friendly as it gets, but I would prefer to have a slightly unfriendlier version. One with a recipe included? :) Thank you, as my hubby LUUUUUVS ginger snaps and I'm looking forward to trying these! Hi Paula. I'm sorry you haven't been able to print this recipe. It's a winner! I have checked the "Priner Friendly Recipe" link and it works as it should. There must be an issue on your end. If you try again and it still doesn't work, please email me at donna@justonedonna.com. I'll be happy to send you the recipe by email. Hi Sue. I'm not familiar with golden syrup, so I can't comment on substituting it for molasses. I'd give it a try though. I made these ginger snaps today. So easy and delicious. They came out perfect with the little cracks on top just like they are supposed to. The only change I made was added a little more of each spice. Thanks for a great recipe! I’m happy you like this recipe, Ethel. I usually use light brown sugar but go ahead and use whatever you have. I’ve never used coconut sugar so I can’t help you with this question. I’ve only made this recipe as written.